Extensive “wet gas” resources have been identified beneath the soils of eastern Ohio. While the current epicenter lies a few miles North and East of Guernsey County, the wave of development of this precious resource is moving south. As of January 2019, over 251 wells have been permitted, drilled or are in the process of being drilled in the county. While we have entered a slowdown period in new exploration, the development of the pipeline infrastructure is going strong in preparation for a return of the high level of drilling activity we have experienced. Numerous well and pipeline service companies have moved to the area over the past several months and still continue to settle here in the county. We have listed below, as accurately as possible, the energy-related companies currently located or operating in the Cambridge area. (Note: Some of these companies are mobile and may have moved on upon completion of their contracted obligation.) We do, however, frequently revise this list. 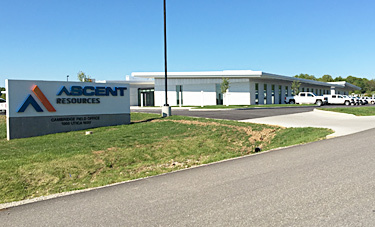 Ascent’s new facility, opened in Fall 2015, houses the company’s regional headquarters. First quarter figures reflect that a number of Ohio’s top-producing wells fly the Ascent logo. Growth in the region fueled by the rapid influx of oil/gas-related industry has injected significant new wealth into the area, and spawned the growth noted in the headline stories cited earlier on this site. County planning is working with the objective of sustaining this growth and soliciting the location of new industry, both in and out of the energy arena. Numerous focus groups are looking at every aspect of current and predicted growth challenges. The Chamber of Commerce sponsors “Coffee & Commerce” meetings monthly to keep local interested citizens updated on recent trends and topics of most current interest. We are embracing the growth and anticipating a bright future.